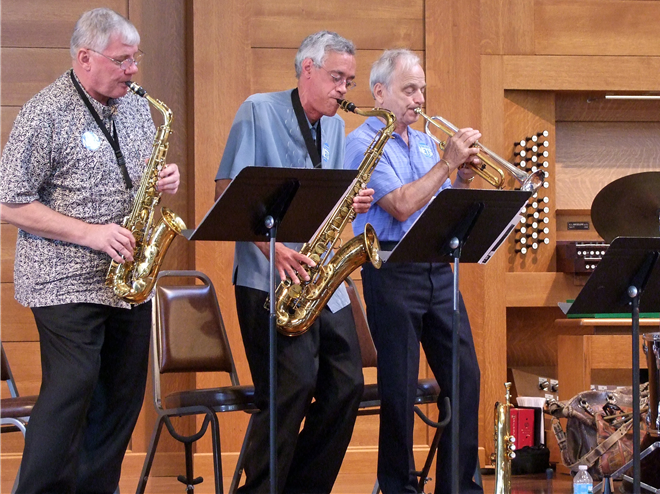 Andy Tecson (center), plays saxophone with Ken Jandes (left, alto sax) and Bobby Lewis (right, trumpet) to kick off Nuts About Nets, July 31 at St. Paul Lutheran Church. Chuhak & Tecson president Andrew Tecson continues to help raise awareness in the global fight against malaria. This Sunday, Tecson, an accomplished jazz musician, will perform with his band Churchjazz at St. Paul Lutheran Church in Davenport, Ia. Tecson’s performance will help kick off Nuts About Nets, St. Paul’s 2011 global initiative for malaria prevention. St. Paul’s goal is to reach 10,000 nets between July 31 and October 2. The number of nets donated will be matched by the Clarke Cares Foundation, a nonprofit that aims to save lives and reduce suffering from mosquito-borne illnesses for people around the world. Malaria, which is transmitted to humans through infected mosquitoes, primarily affects people living in tropical climates. The Centers for Disease Control estimates that there are between 300 and 500 million malaria cases every year, with more than a million deaths resulting from the disease. Malaria nets create a protective barrier at night, enabling people to sleep without the risk of becoming infected. Nets collected through St. Paul’s initiative will be sent to families in Nigeria. Tecson has previously sponsored and performed at other events dedicated to malaria prevention, and he is slated to perform at a Clarke Cares concert in early October. For more information about this weekend’s events or to donate to the fight against malaria, visit Clarke Cares Foundation at http://clarkecares.org.